With census records so sparse in Ireland you need other ways to trace your ancestors, and land records are a good genealogy source. Again, they're not widespread, and often with not a great deal of value. But they're what exists, and with some work can help flesh out a sketchy family history picture. Under the 1823 Composition Act, tithes that had been paid to the Church of Ireland in kind were now to be paid in money. That meant all the land had to be valued, an ongoing exercise that last until 1838, when tithes were finally abolished. However, due to a very inequitable system, it was the poor who suffered most under the Act. 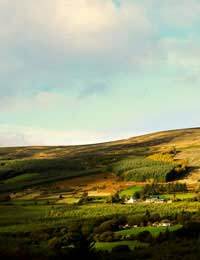 You'll find that the valuation records valuable as a genealogy resource because they list the amount of tithe to be paid, the amount of land owned, the townland in which it was located, and the landholder's name. However, it was never meant to stand as a census, just a land record, so without other family information it's not a great deal of use; however, it was the only survey of Ireland from the period. Equally interesting are the documents from the so-called "Tithe War" of 1831, a mass protest against the tithes. In order for parishes to claim compensation, lists of those who refused to pay had to be compiled. Well over 100 of these lists still exist, incredibly useful for family history and those from several counties can be found in the National Archives. Both the Archives and the National Library of Ireland have microfilm copies of the Applotment books. The Northern Ireland records are available in the Public Record Office. The National Library Index of Surnames has the surnames from these documents indexed. Although it's unlikely that you'll find anything conclusive here, since data for Ireland is so limited, anything can prove valuable in tracing an ancestor from the period. Perhaps the most valuable existing genealogy document for Ireland in the mid 19th century is Griffith's Valuation, named for Richard Griffith, who spent 16 years assembling a valuation of all the land in Ireland for the purposes of implementing the 1842 Tenement Act, which determined the taxable value of the land. The Valuation lists the acreage of a property, along with a description, the names of the landowner and the person leasing the land, and a valuation of the land, an important stop in any genealogy search. Griffith had actually begun his work in the 1830s, but his real contribution came later with the assembling of the valuation. Although the information might seem fairly basic, some family history information can be deduced from it. If a person was described as a labourer or cottar, that meant they held less than five acres, and the traditional procedure of using the father's name to distinguish between two men having the same name helps establish your ancestor and his family relationships. Given the absence of censuses, the Valuation takes on special importance as a snapshot of the country at the time. Many major libraries in Ireland stock it, and it can be found both in published editions and on microfilm. There are other Irish land records which could prove useful, but to employ them properly requires a lot of work - in other words, typical for genealogy. Estate records, though, tend to be less vital than you'd imagine, since land was let, then sub let, and sub let and sub let again, so records for those at the bottom of the chain are generally non existent. However, going back to the late 18th century, rent rolls can become a significant source of information on your ancestor, although once again a genealogy search will require a lot of digging. The National Archives and the National Library have repositories of estate records.